Emily received her undergraduate degree from UCLA with a B.S. in Biology. Her undergraduate work ranged from studying reproductive trade-offs in whip spiders, biodiversity and conservation in the Congo Basin and taxonomy in eastern Pacific rays. 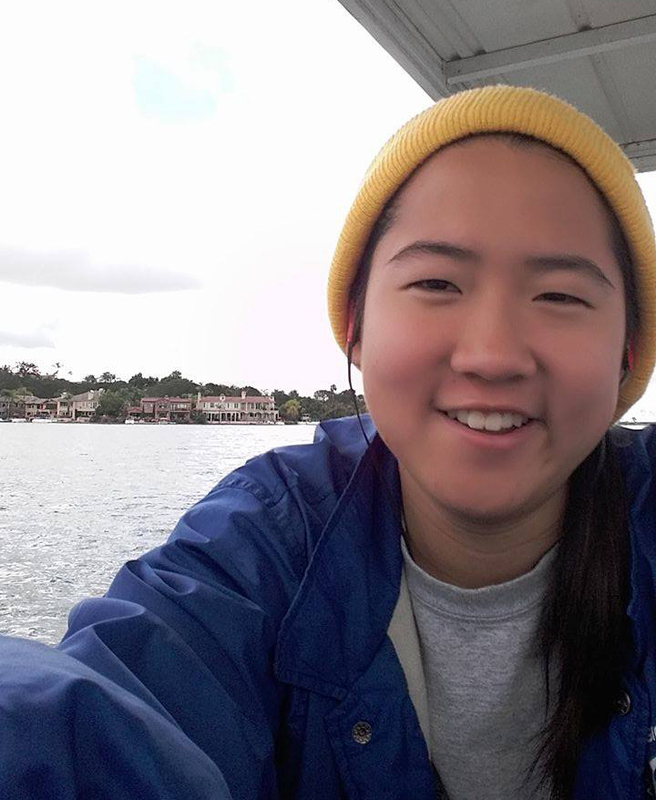 Emily has worked in lake management at Lake Mission Viejo, California where she sampled and tested water quality, surveyed wildlife and conducted general lake maintenance. 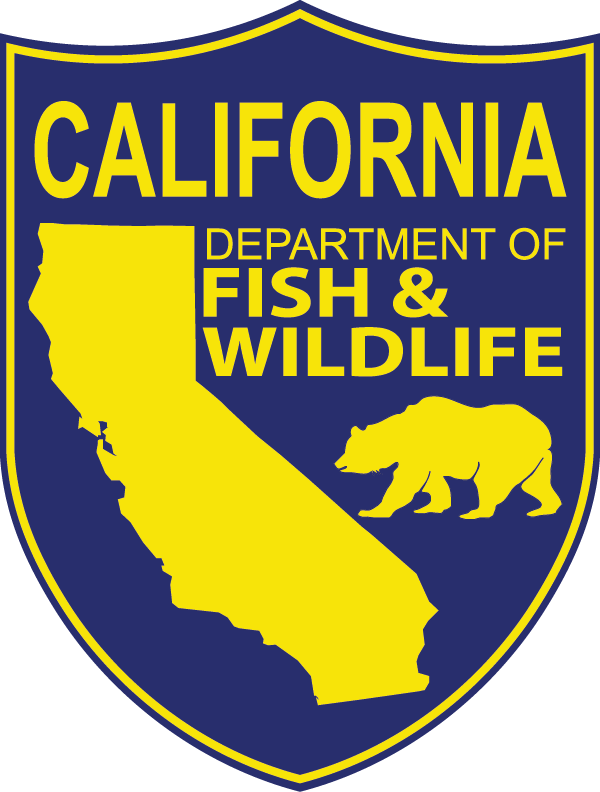 Emily joined the California Cooperative Fish and Wildlife Unit in August 2017 and is pursuing a M.S. degree in Fisheries Biology under Dr. Mark Henderson. 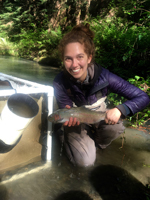 Emily will be assisting in the lifecycle monitoring in Redwood Creek, California and building a life cycle model. She plans to use ecological models as a tool to understand the population dynamics of salmonids. Hannah received her B.S. degree in Biological Sciences with a minor in Environmental Studies from St. Mary's College of Maryland. Following graduation she worked her way west with stops at Flathead Lake Biological Station in Montana, spent a term with the Americorps Watershed Stewards Program, and a few seasons with both the California and Washington State Departments of Fish and Wildlife conducting salmonid spawning ground surveys and rotary screw trap work. Although she enjoyed working with salmonids, she was drawn back to her coastal roots and wanted to study estuarine environments. Hannah was admitted to the Fisheries Program in January 2017 and is currently pursuing a master's degree with Dr. Mark Henderson. Hannah hopes that by earning an advanced degree will facilitate her future endeavors to explore the impacts of human actions on the aquatic environment with the goal of influencing management decisions to aid in the conservation of ecosystems for generations to come. John received his undergraduate degree in Biology from Wartburg College in Waverly, Iowa. 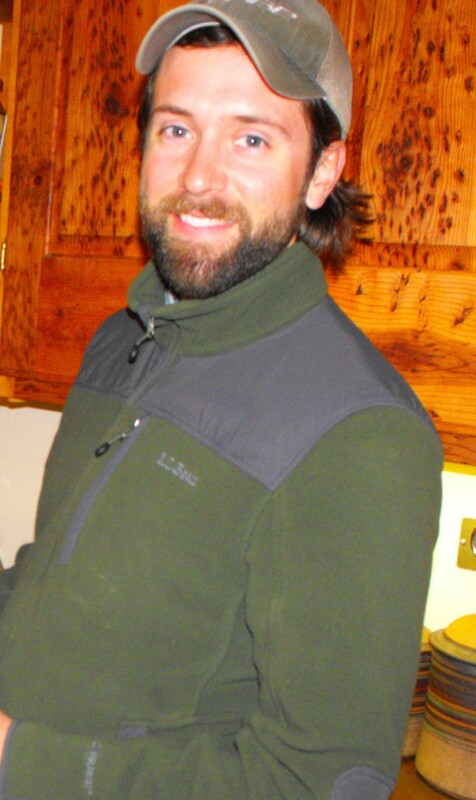 His interests in fisheries followed beginning with his two terms with AmeriCorps Watershed Stewards Project in Mendocino and Humboldt County. 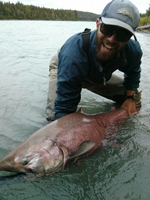 Through work with the Department of Fish & Wildlife and the Smith River Alliance, he focused his career path on salmon and steelhead. John is pursuing a master's degree in the Fisheries program in the College of Natural Resources and Sciences under advisor Dr. Peggy Wilzbach where his studies will be focused on coho salmon. 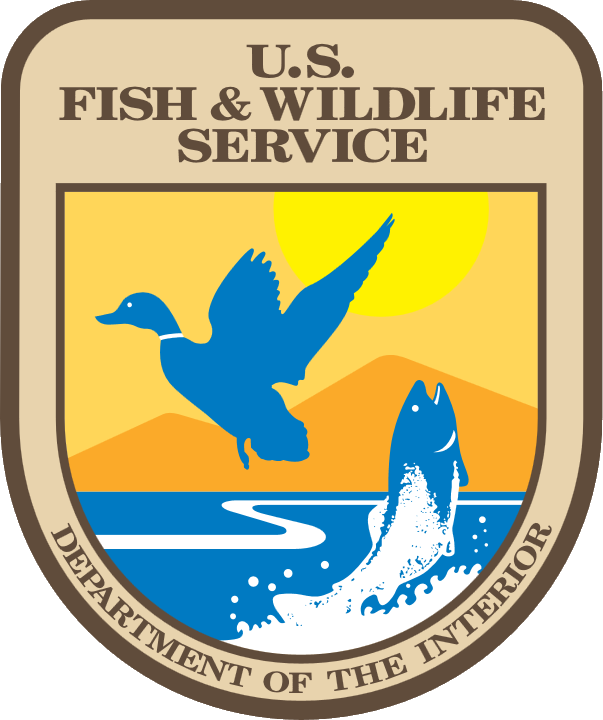 Across the Southern Oregon Northern California Coast (SONCC) coho ESU, the species decline has lead to federal and state listings under the federal and California Endangered Species acts. 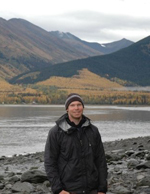 Earning an advanced degree will aid his pursuit to investigate such vital life history attributes of coho salmon as growth, emigration and survival, in order to better understand, manage and recover fish populations. Jon received his B.A. from Ohio Wesleyan University with a double major in Biology and Environmental Studies in 2007. 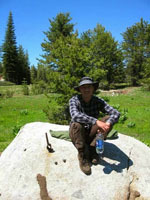 Since graduating, he has worked with both USGS Western Ecological Research Center and California's Department of Fish and Wildlife conducting research involving long-term monitoring of forest conditions in national parks across California and Oregon, hydrology analysis in the San Francisco and Klamath regions, and salmon spawning and life cycle monitoring across the north coast of California. Jon joined the California Cooperative Fish and Wildlife Research Unit in January 2015 and is pursuing a MS degree in Fisheries Biology. Emerson joined the Coop Unit Fall 2017 seeking his M.S. degree in Fisheries under the advising of Mark Henderson. 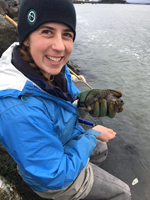 Before joining the Unit, Emerson has worked for NOAA at the Southwest Fisheries Science Center working on a life-cycle monitoring station on Scott Creek conducting spawner surveys, lagoon seines, electrofishing, adult and juvenile trapping and habitat assessment for salmonids. He has worked as a watershed steward, a land health assessment technician for the Great Basin Institute, worked for the California Environmental Protection Agency monitoring surface water in California for pesticide analysis and water quality parameters in urban and agricultural regions and was employed by Arizona State University performing field work altering available water resources to terrestrial invertebrates, monitored arachnid and insect populations and conducted radio-telemetry for Desert Whip-tail lizards. Nissa joined the Coop Unit August 2017 and is currently seeking her M.S. degree in Fisheries under Mark Henderson. 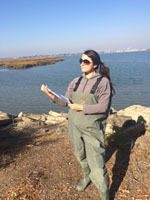 She is a recipient of NOAA's Dr. Nancy Foster scholarship. Nissa is studying the deep sea coral habitats in the Channel Islands National Marine Sanctuary. In her free time she enjoys backpacking, birding, botanizing and any excuse to be outdoors. Nissa is a performing member of the Bay Area dance troupe, Blue Diamonds Belly Dance, and has performed at many benefit and fundraisers. Chris joined the Coop Unit as a M.S. student in the Fall 2017 with Mark Henderson as his advisor. Chris received his B.S. degree from UC Santa Cruz in Ecology and Evolutionary Biology in 2010. Since that time he has worked with the U.S. Forest Service monitoring native populations of California Golden Trout and Mountain Yellow-legged Frogs in Sequoia-Kings Canyon National Park and in the Golden Trout Wilderness. He has also worked as a hatchery assistant, a Spotted Owl technician and as a staff scientist for Pacific Gas and Electric assessing environmental impacts. Chris' project is estimating the abundance and distribution of Salmonid Piscivores in the Sacramento-San Joaquin Delta using DIDSON acoustic cameras. I hail from Carlsbad, California receiving my B.S. in Wildlife, Fish and Conservation Biology with an emphasis in Wildlife Biology from the University of California at Davis advised by Peter Moyle. My fieldwork has included avian point counts on the Seward Peninsula in Alaska, spawner surveys in California's Central Valley and shark surveys on the Southeast Farallon Island. Federal and state agencies, private consulting companies and non-profit organizations have all been employers in the past. These experiences have shaped my particular interest in restoration effectiveness and collaboration among agencies, non-profit groups and other stakeholders. With a lifelong enthusiasm for exploring natural processes and a love for fish biology, I will continue to pursue these themes at Humboldt State University. Nick hails from North Central Texas and received his undergraduate degree from Colorado State University with a BS in Wildlife Biology. Since then, he has been working with salmonids in Northern California. 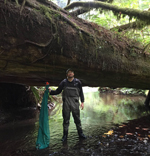 Nick is currently pursuing his master's degree in Fisheries at Humboldt State University where he is focusing on characterizing habitat preferences of juvenile Coho Salmon rearing in non-natal streams.